Welcome to EVThing.me I am Jeff Southern from Kennesaw, GA. You have reached EVThing.me. 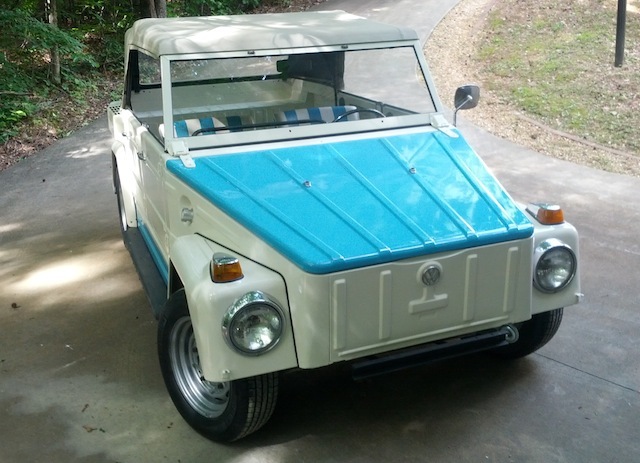 This site was created that that you can follow the conversion of my 1974 Volkswagen Thing to electric Drive. I purchased the car off of Ebay in June of 2012. 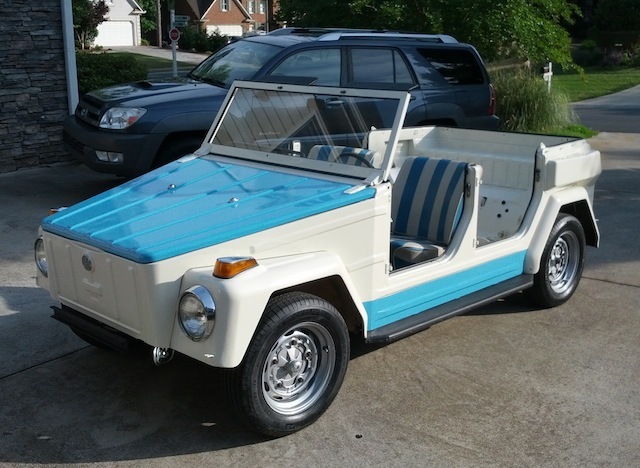 I thought that this would be a fun car to convert and drive. I wanted a car that would draw a little attention so that I could inform people about the possibility of building and driving their own electric car. 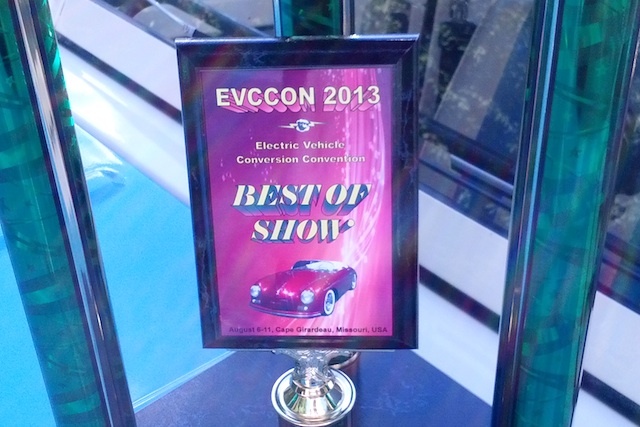 Latest Picture August 11th, The EVThing won Best In Show EVCCON 2013! 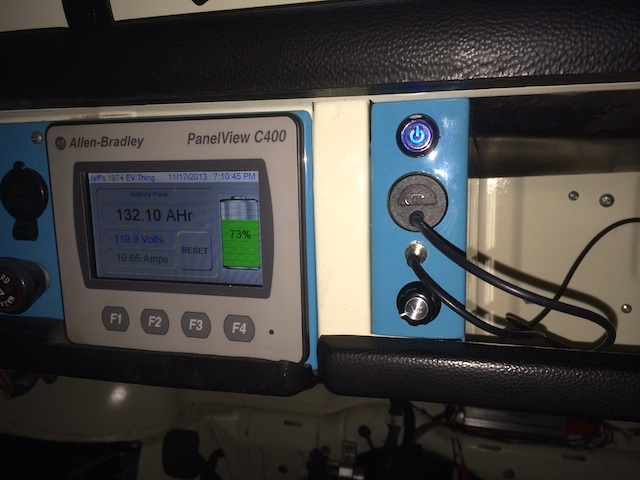 Battery Management The charging and AmpHr meter is controlled by an Allen Bradley Micrologix 1100 PLC. Range 70-80 miles on a full charge with 20% batter capacity left. It will do 90 miles on one charge to empty. Weight The total weight of the car and batteries is 2400lb on certified scales. Braking Front Disc and rear drums plus up to 25Kw of regenerative braking. Best stop from 60mph is about 120ft. DC to DC Converters I have a Meanwell 480 Watt 12vdc and a AllenBradley 50W 24VDC Converter. 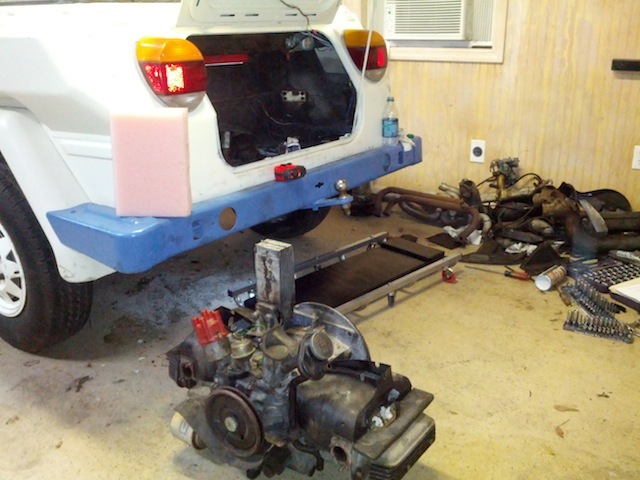 Started on the project by removing the engine and transaxle. This was truly a messy Job. It looked like there had been a small engine fire on the driver's side. 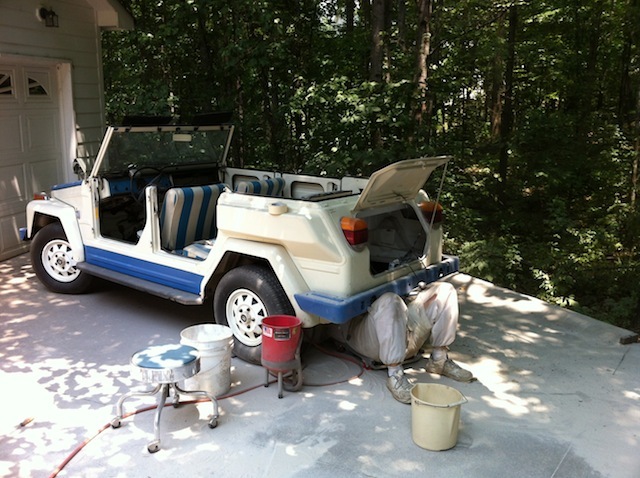 Once the engine and transaxle was out, I decided to blast away the nearly 40 years of grime and rust in the engine compartment. Of course this happened to be one of the hottest days of the summer. At least the sand stayed nice and dry and did not clog up the gun. Yep, this is how I spent my 2012 Fourth of July. I guess I really wanted to declare my personal independence of the oil companies. Once I got the engine compartment cleaned. I sprayed in a heavy coat of primer. The engine compartment looked so good that I decided to blast the area over the transaxle. It was very rusty, but cleaned up well with no apparent rust holes. Once cleaned, I sprayed in some Rustoleum flat black paint to protect the metal. About 3/4 of the pans on both sides were rusted out in the rear. I had to replace them. Since I am fairly tall, I also moved the seat track back about 2-1/2". I also had to patch a few small holes in the front of the pans. I bought a set of reproduction 3/4 length pans from the Thing Shop and welded them in with a MIG welder. This part of the restoration took the most amount of time to date. I decided to fabricate the rear battery boxes out of 0.05" thick sheet aluminum. This should keep the weight down and still provide enough strength to carry the battery weight. The shape of the boxes were dictated by the rear structural members on each side of the car. 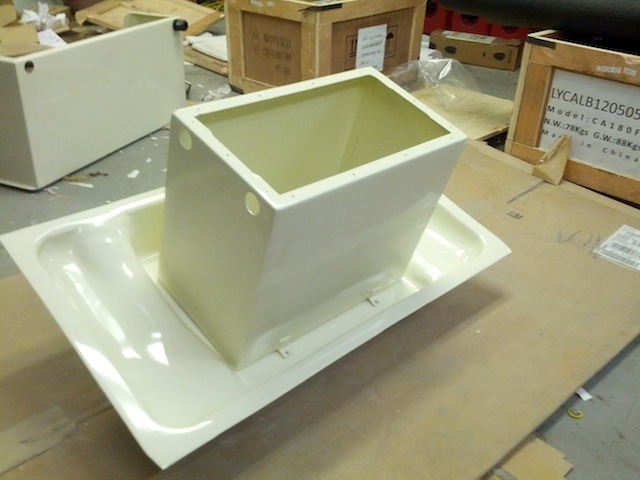 The boxes will be tack welded and seam welded together for strength and to weather proof the batteries. 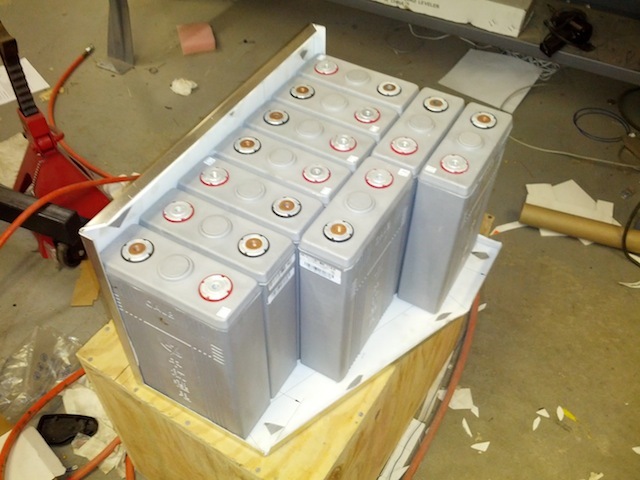 Each one of the rear boxes will hold 10 of the 180AH cells. I decided to paint the battery boxes body color. I thought that this would give the car a more professional appearance. Assembled Motor, Adapter plate, Clutch and Flywheel. 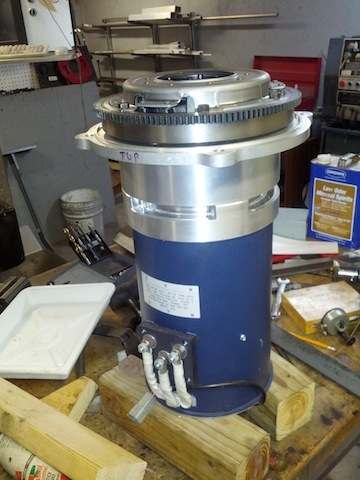 The motor is an HPEVS AC50 with a Curtis 1238-7601 650 amp controller. At 120VDC, It will produce about 70 peak HP in the 3800rpm range. This should make the car a little more powerful than a Stock VW Thing. 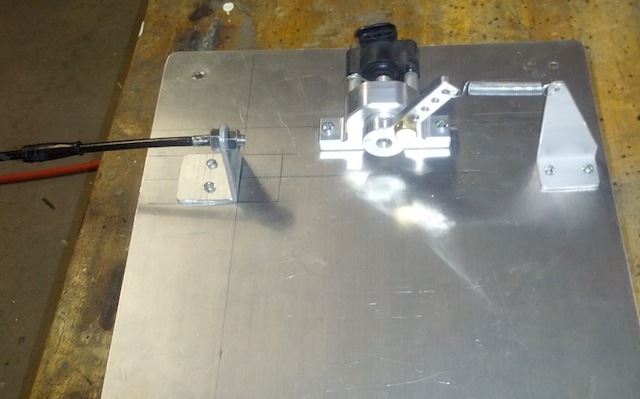 The Adapter Plate was purchased from Thunder Struct Motors. Finally got the AC-50 motor installed with the Support brackets welded in to support the battery boxes. I installed a rebuilt transaxle with a 3:44 ring and pinion gearing. The stock VW transaxle has a 4:12 gear set. This is way too low to be useful with an electric drive system. Since the electrical motor makes all 110ft-lb of its available torque from ZERO RPM, I really needed the higher gearing. Otherwise 1st gear would be nearly useless in the car. 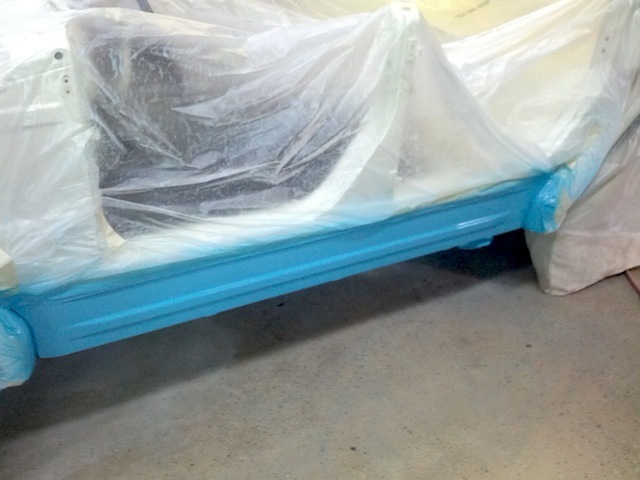 I also sprayed the engine compartment in a coat of fresh paint. I made a set of speaker mounting plates out of 0.05" Aluminum for the front and rear of the car. I am going to try something a little different with the sound system in the car. I am only going to have a 3.5mm AUX input jack and a bluetooth input to a 50W audio amplifier. 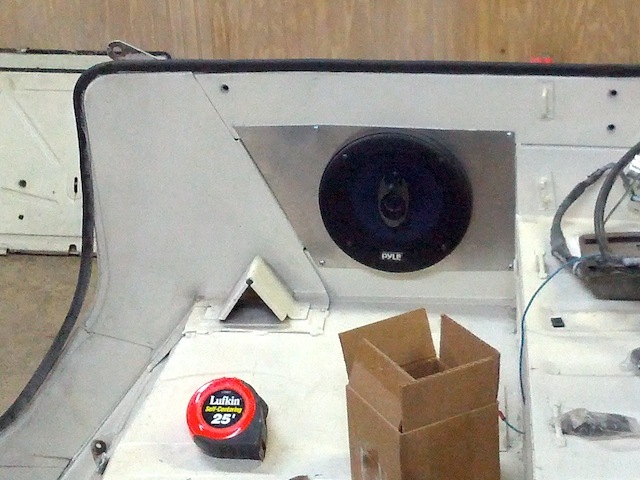 The amplifier will have an On/OFF switch and volume control on the dash but no other controls. I will not have a radio or CD player mounted in the car. I will use my Android smart phone for all Audio playback and turn by turn navigation. 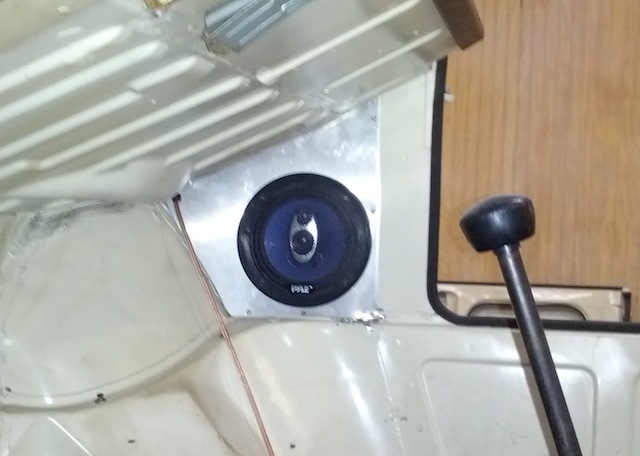 It will have four 6" round dual cone speakers and I will add a powered subwoofer if I want more bass from the system. 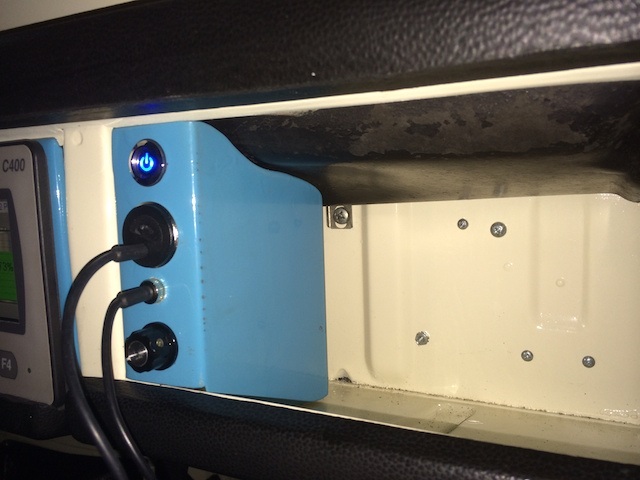 I Installed the Sea Blue 600A battery cutoff switch. I decided to mount it in the firewall so that you can get to it through the glove box. I liked the idea of being able to disconnect the pack from inside the car. 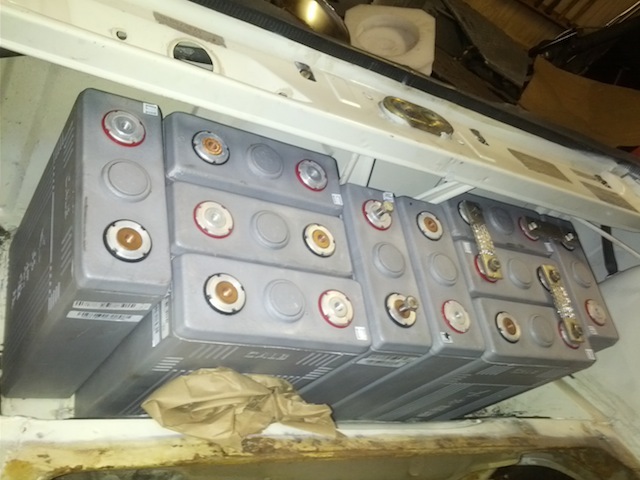 Found a battery configuration that would allow me to get 10 cells in the recess in the front of the car. 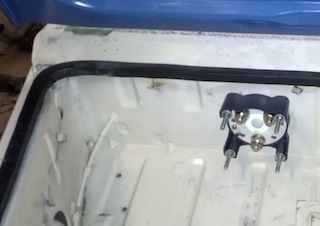 This configuration allowed the use of standard battery straps and fits with NO modification of the sheet metal. It even clears the front support for the hood latch. I really did not want to have to alter this support. Sometimes you just get lucky. Who said playing Tetris was a waste of time!! I made the front battery box out of 0.05" sheet aluminum like the rear battery boxes. However, it is not a full box. 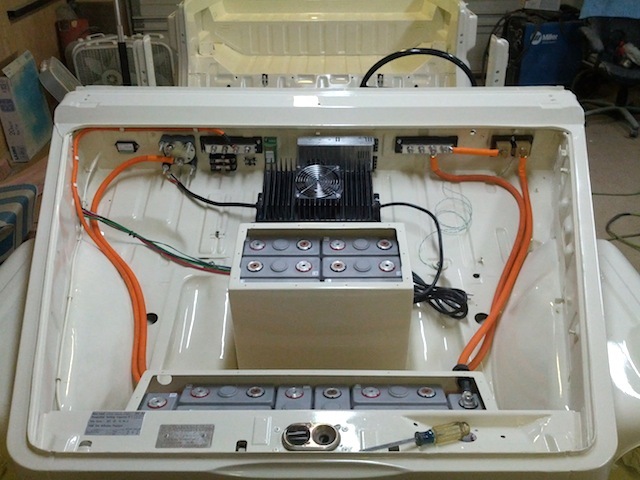 The front is open and I will install some anti-static shipping foam to hold the batteries tightly in place. I will glue the foam in place with contact cement. This will give some padding for the batteries in the event of a front impact. I painted the front battery box the body color. Here you can see that the front of the box is open. 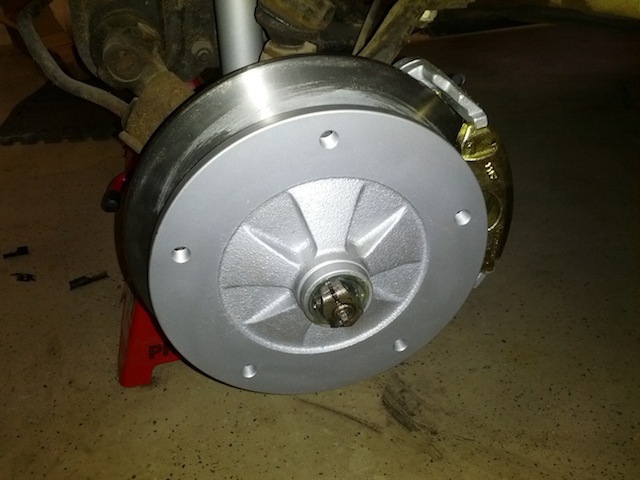 I just finished rebuilding the rear brakes, bearings and seals. 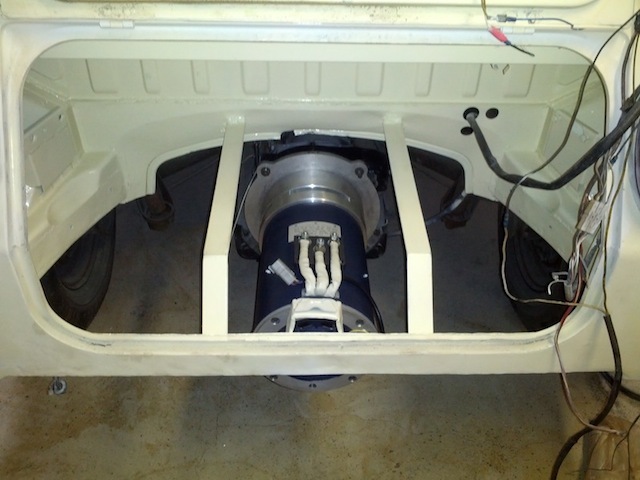 I also just completed a conversion of the Front Brakes from Drum to Disc. I painted the rear drums and front rotors with Duplicolor Silver high temperature caliper paint to keep them from rusting so badly. I replaced the tired old shocks with Heavy duty gas filled shocks. 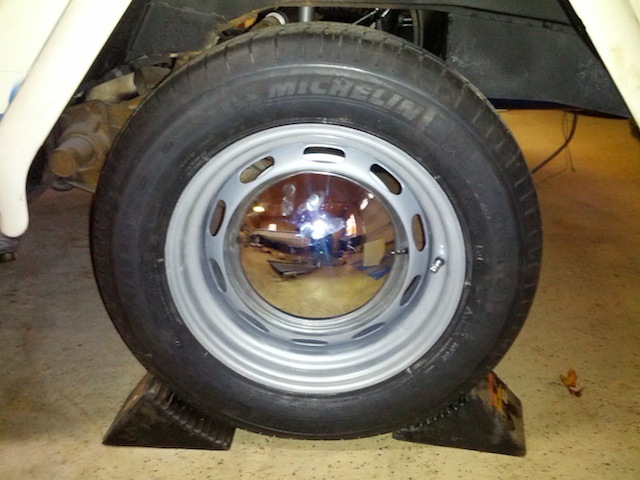 I installed a new set of 15" Porsche 356 wheels with baby moon hubcaps. I decided to go with Michelin Energy Saver A/S Tires size 195R65/15. These tires are nearly the same diameter as the original tires. This should make the old speedometer fairly accurate. I cut out the old Gas Filler neck and welded in a steel plate. I will mount my J1772 electrical charging port in this location. I finally got around to bleeding the brakes. I was waiting until I had time to make a 4 Way Tee for the rear of the car to replace the stock 3 way tee. I did this so that I could install a brake pressure transducer. This will output a voltage proportional to the applied brake pressure. This will be feed into the Curtis Controller so it can increase the regenerative braking as more pressure is applied to the brakes. I machined it out of brass. 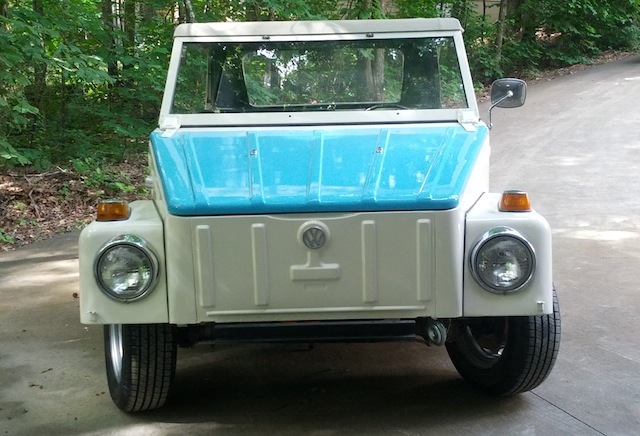 The Front, left and right ports are standard VW 10 x 1mm bubble head brake ports. The rear port is 1/8 NPT. 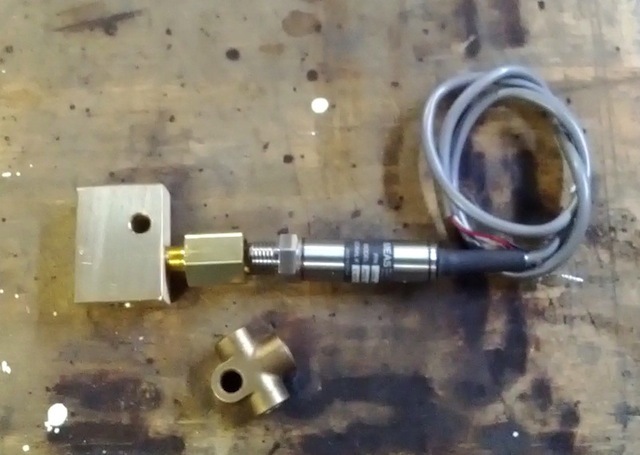 However, my transducer was a 1/4" NPT, so I used a brass Parker hydraulic fitting to adapter the sensor to the Tee. 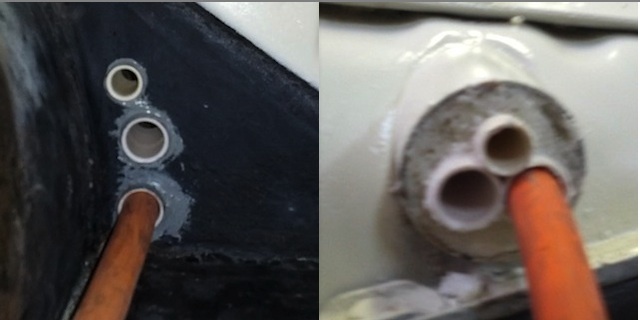 The Fittings should seal because of the taped treads, however, I always feel more comfortable using a thread sealant. Since this is a brake system, I used the Permatex 54540 sealer. This is formulated for hydraulic fittings and can provide up to 10,000 psi seal when fully cured. Cheap Insurance against leaks. Well, I have had better days. I decided to show the bad with the Good. I have been having trouble getting the Throttle Linkage to work well. In the Thing the Accelerator pedal uses a wire running from the pedal to the rear of the car. 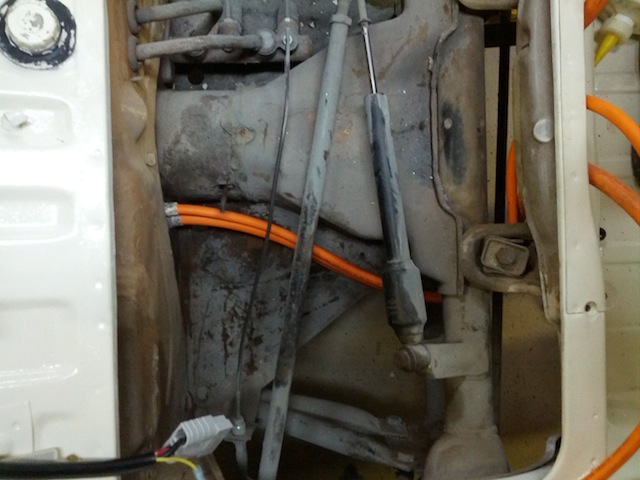 The cable comes out right beside the transaxle. I have not been able to find a good mounting point for the Evnetics Pot. I thought I found a good location and made a plate to mount on the bottom of the sheet metal above the transaxle. There are two good cross members that I could mount the plate to. So, the Assembly you see is actually mounted upside down in the car. I installed this assembly in the car and after testing the pedal for a while, the cable broke at the brass cable adapter. I made the cable attachment point out of a brass bolt. I drilled a hole through the head to accept the cable. I then drilled and tapped a another hole about 60 degrees on an adjacent face on the hex head. I put a set Screw in this hole to lock the cable. I think it was not turning freely as the level arm moved and broke the cable. I ordered a new cable and will try again. If this does not work, I have a few days down the drain in this assembly. 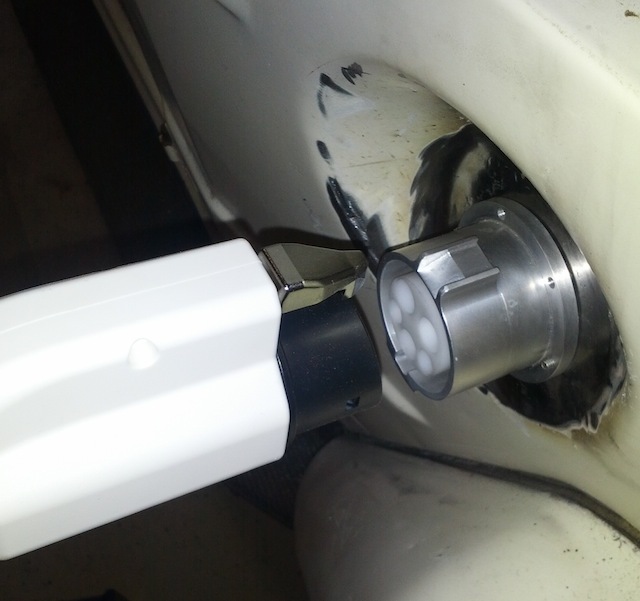 I mounted the J1772 Connector to the car today. I will still need to make a spring loaded lid for it, but I was pleased with the results. I will do a little body work and clean up the area when I am ready to paint the car. 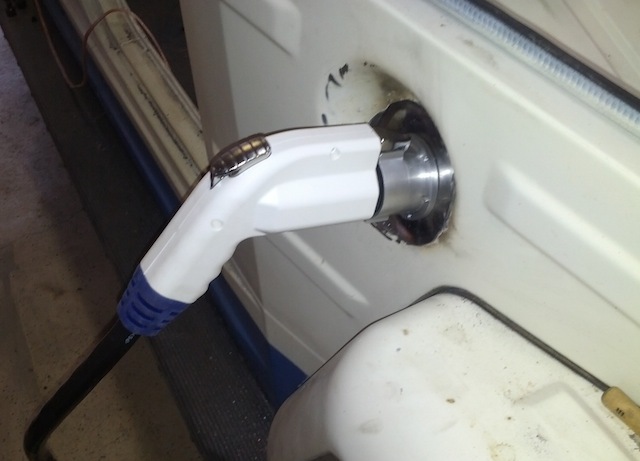 This connector and a small circuit board should let the car charge on any standard Level 1 or Level 2 charging station. Well, I finally sorted out the throttle assembly. I did not like the way the throttle cable pull system worked. It was loud and had a tendency to bind up (Not good in an accelerator pedal) so I redesigned the original assembly to directly actuate the Evnetic Potentiometer. I uploaded this Video so that you can see how it works. 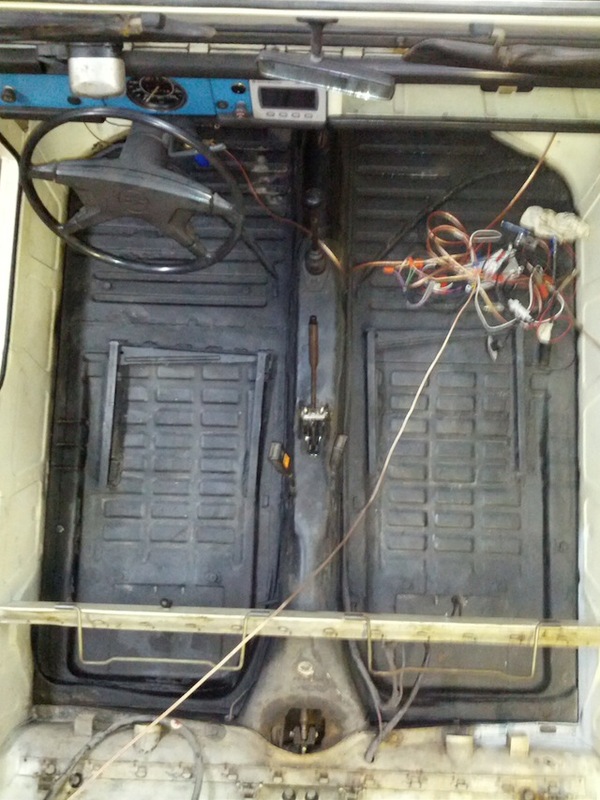 I had planned to put the 6 orphaned cells under the rear seats. However, I did not like putting them on their side to fit under the seat. It would make it hard to get to these cells. 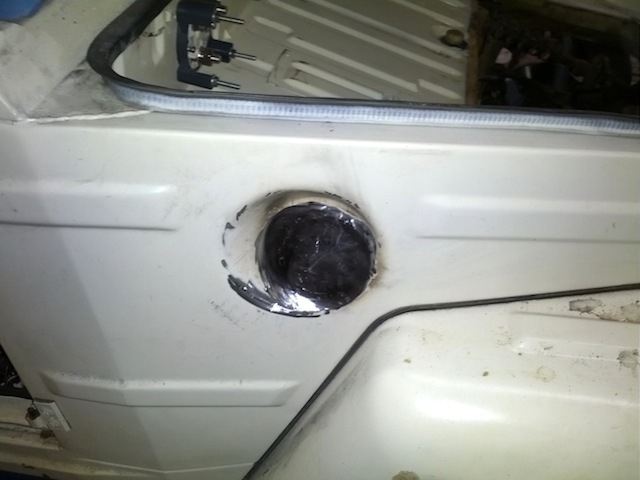 So, I decided to put them where the original gas tank was in the front of the car. To make a solid mounting surface and make sure it cleared the suspension and steering column, I cut the top off of the old gas tank. I then sand blasted the rust away and welded in a false bottom plate to get a flat surface. 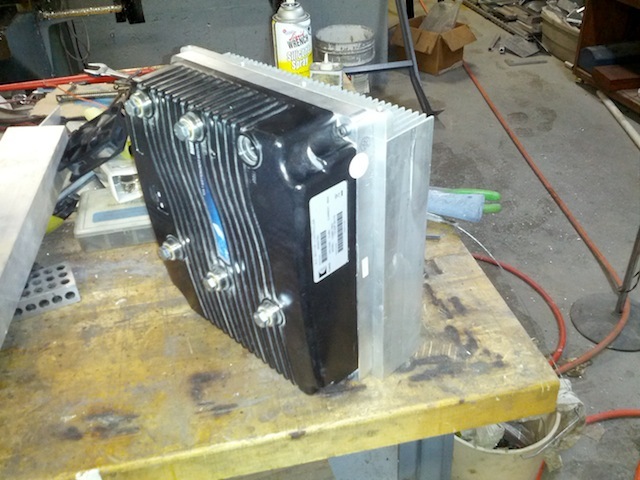 I then fabricated a new battery box out of 0.05" Aluminum sheet. I spot and seam welded the box for strength. It might not look like it, but it clears the hood by about an inch. 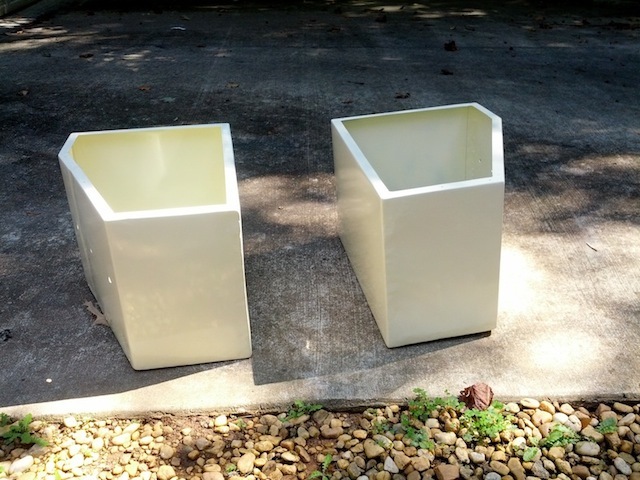 I will be painting the box and the support in body color (Wimbledon White) like the other three boxes. This was the last major fabrication that I had to do before starting final assembly. The next step is to finish the body work and prime and paint the car. I got the front battery box and support for the six orphaned cells painted. 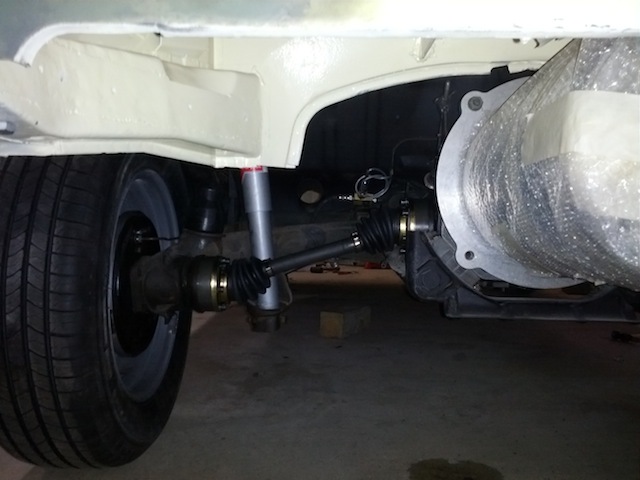 I also installed the new Drive shafts, CV Joints and Boots. These were the last mechanical parts I needed to add to the car before starting final assembly. 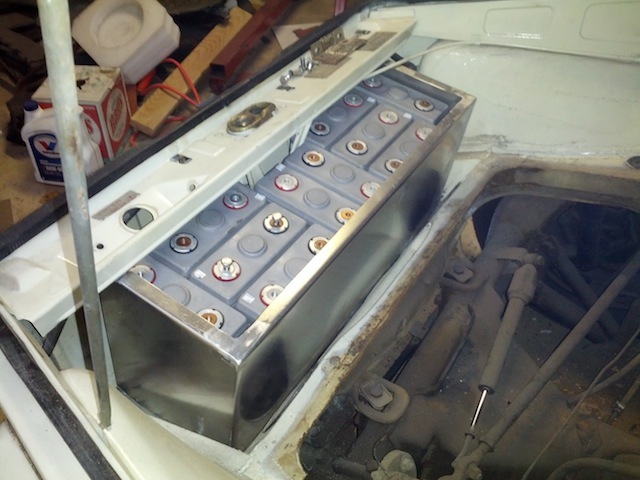 So, I installed the rear battery boxes and ten cells in each box. Because of the odd shape of the boxes, there are several voids between some of the cells/walls. I am going to put some anti-static foam in the voids. I also lined the bottom of the battery boxes with a rubber material. I bought one of those 1/4" matts designed to go under a treadmill or other exercise equipment to protect the floor. This material is very cheap, durable and easy to cut. 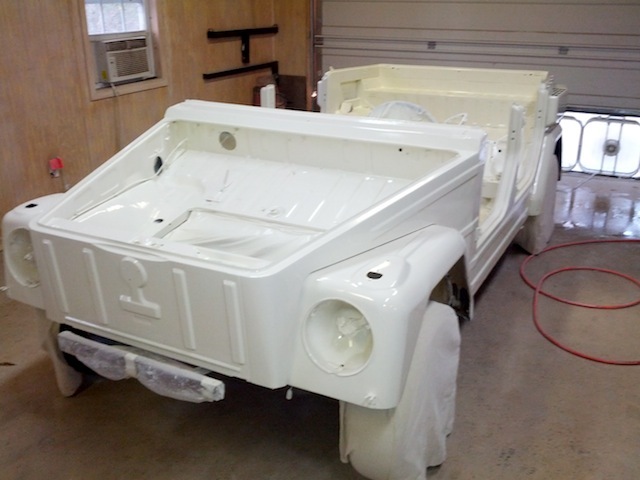 Well, the body now has three good coats of Wimbledon White on it. All of that sanding seems to have paid off. I sanded out a few places on the car and used glazing putty to fill in a few small pits and scratches. I then wet sanded the entire car with 1000 grit sandpaper. After it dried, I went over the entire car with a very fine Scotchbright pad. I then rolled the car outside and blew off the dust with an air nozzle. Once I had gotten most of the dust off, I wiped the entire body down with denatured alcohol to remove any grease or oils (the oils on your hands can ruin a paint job). Once it was wiped down, I mixed up the paint that I would need (about 64 ounces). I shot a tack coat on the car. 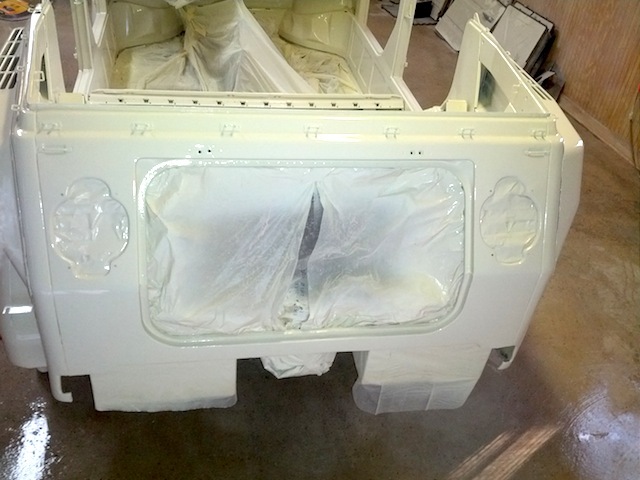 A tack coat is a light coat of paint that helps additional coats stick to the primer. To shoot this coat, you open the fan up wide on the gun and shoot this as a semi-wet coat. You should see the primer through this coat. I let it flash for about 5 minutes, tightened the fan up on the gun and added a little more paint to the spray to shoot some wet coats. I shot two good wet coats on the car. (three on some areas like the front that gets the worst of the environment.) 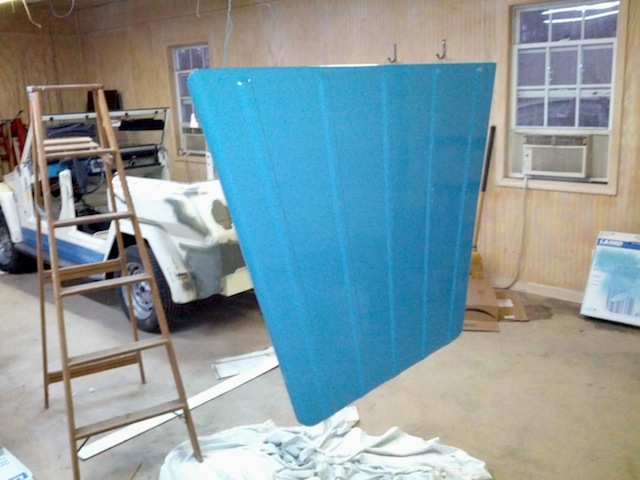 I still need to shoot the doors, rear deck lid and a few dash panels, and of course, the lower blue stripe to finish up the painting. 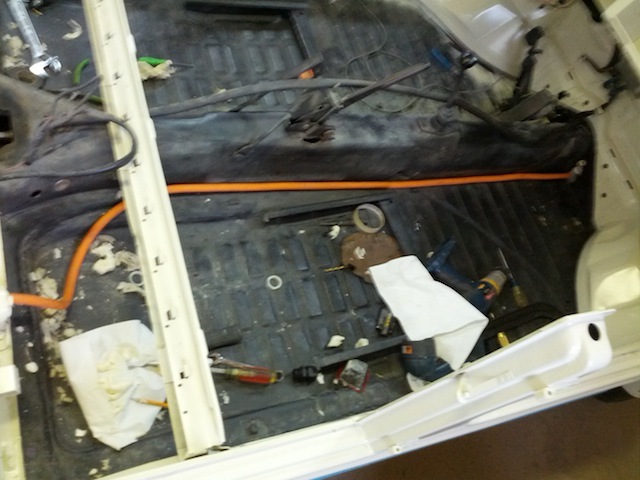 However, having the body painted allows me to go ahead and finish the wiring and install all of the remaining components that make an electric car go. Well, I did not feel that great this weekend. As a result, I did not get as much accomplished on the car as I would have liked. However, I did make some Progress. 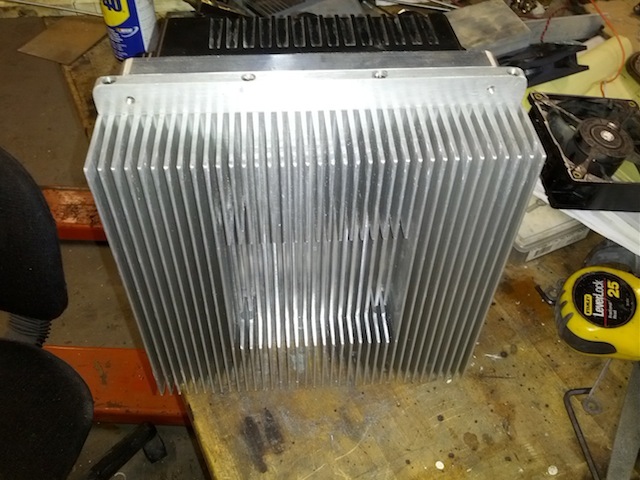 I machined a recess for a 12vdc fan for the heatsink that I am going to use with the controller. I bought this heathsink off Ebay. It is 10" x 10" x 2-3/8" tall. 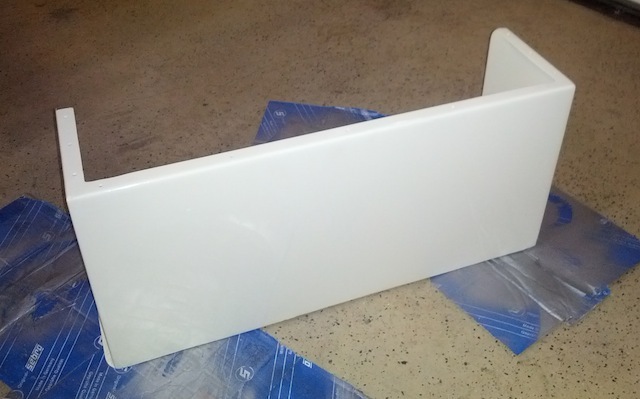 The mounting plate is 3/8" thick and the fins are 2" tall. This should be able to keep the controller within its operating temperature without having to use the liquid cooling plate that came with the AC-50 Kit I bought from EVTV. There is plenty of ventilation and room in the engine compartment of the Thing and I just did not see any reason to add a more complex liquid cooling system. I had to make a little 3/8" thick extension to bolt on the heatsink as the controller is about 3/4" longer. If it cant keep the controller within the proper operating temperature, I can always add the chill plate, pump, reservoir, and radiator later if needed. 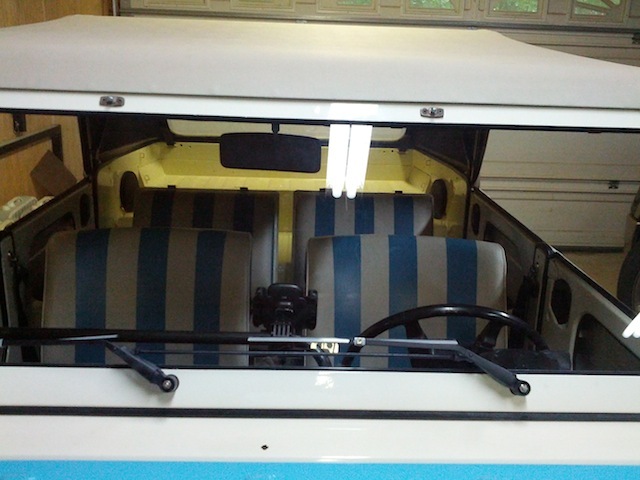 I also managed to get the stripes painted on the car and paint the dash panels and the license plate light housing. These are painted in the Costal Blue color. I really like this shade of blue against the Wimbledon white. So, the only parts left to paint blue will be the bumpers. 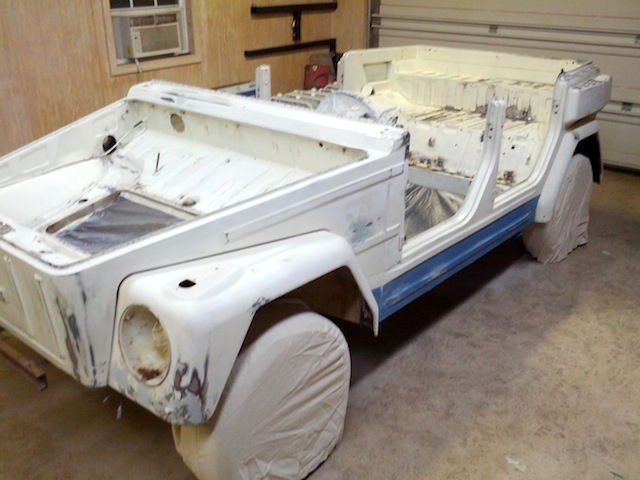 I will still need to paint the doors, rear seat frames, and windshield frame. 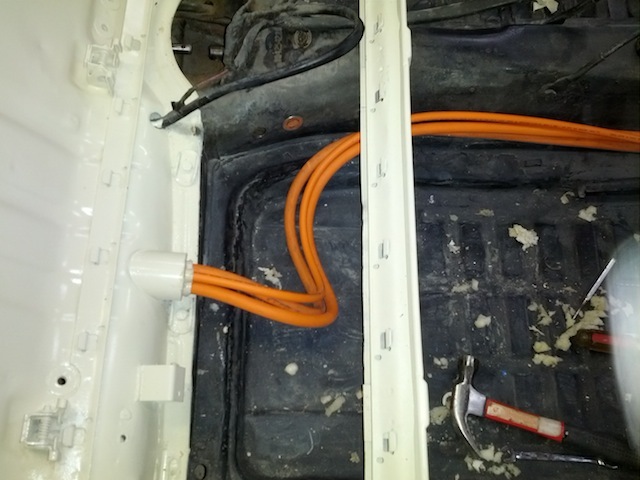 I finally got the main power cables routed through the car. I spent quite a lot of time planning this routing. I wanted to make sure that they would not rub against the frame. I thought about routing them through the center tunnel. (I even drilled three holes for bushings in it) However, after inspecting the tunnel, I found that there were a lot of sharp exposed metal edges in the tunnel. I was worried about the cables rubbing against these sharp edges. I thought about feeding conduit through the tunnel, but was worried it might interfere with the shift linkage and or the clutch linkage. 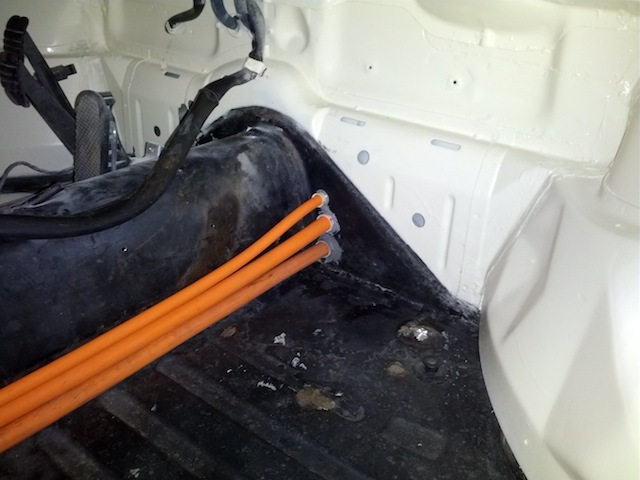 After worrying about this way too long, I decided to run the cables along the side of the tunnel through the car. 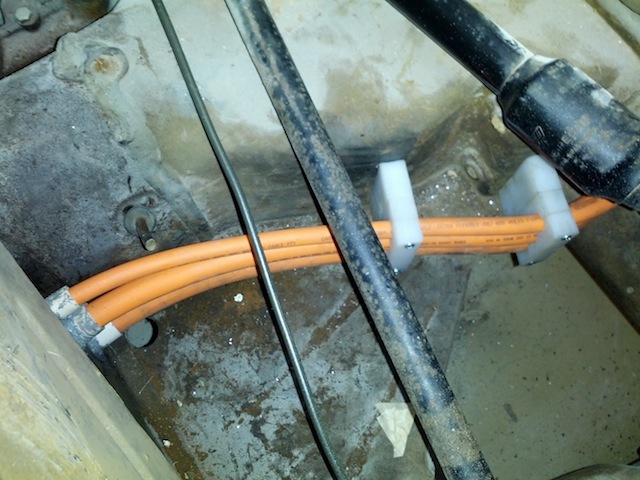 I made some PVC bulkheads to safely feed the cables through the front and rear of the car's fire walls. The three in the rear go through the hole that was originally used to feed the passenger side heater vents. I just held the tubes in place with masking tape and filled the hole up with expanding foam. It works great and forms a water proof seal. On the front Firewall, (Which is a double wall) I used a little JB Weld epoxy to seal and hold the tubes in place. 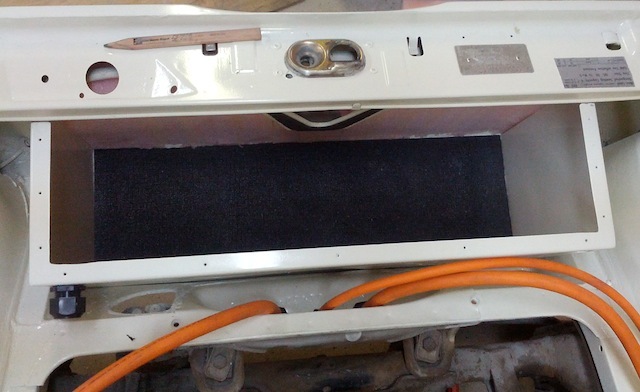 One of the two larger 2/0 AWG Cables connects the rear batteries with the front batteries through the 600A cutoff switch. The other larger 2/0 AWG cable is from the most negative part of the battery pack that is located in the front of the car. 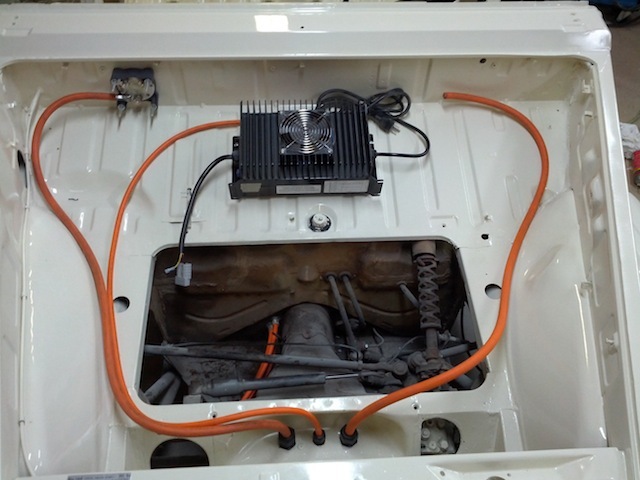 The smaller 2 AWG cable is connected to the most positive part of the battery pack in the rear of the car. Of course I have fuses on these cables just in case one or more of the cables gets shorted out. 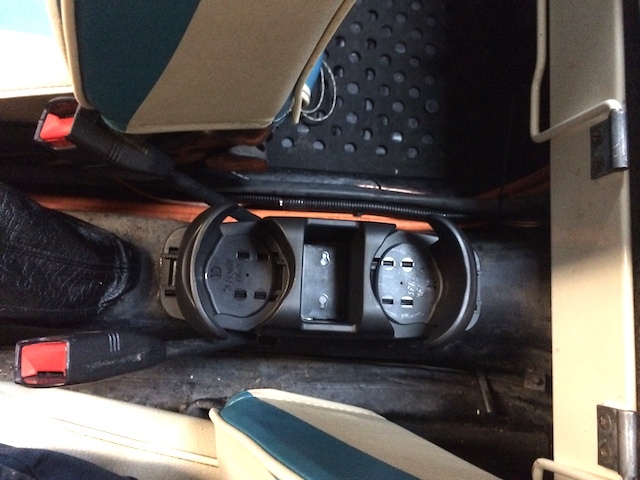 The reason I am running the smaller cable to the front is so that I can connect the charger in the front of the car to the most positive part of the battery pack. It will also carry the current to power my two DC-DC power supplies (I have a 12VDC Bus and a 24VDC bus). I doubt the charging current would ever exceed 100amps, so that is the size fuse I will use on this cable. I will make a sheet metal cover to shield the cables on the side of the tunnel. This shield will serve three purposes. First, it will protect the cables from abrasions. 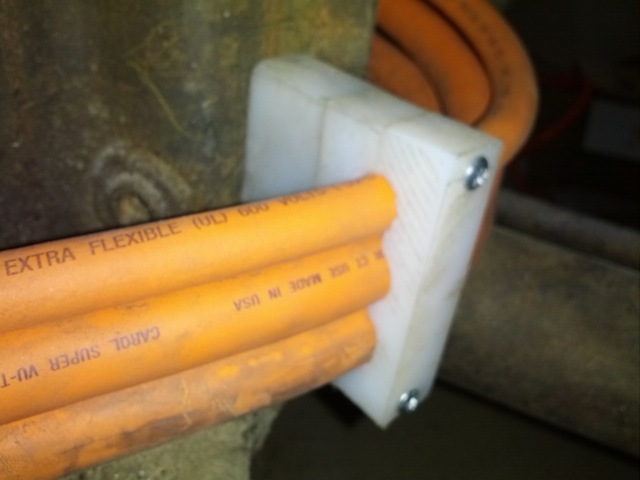 Second, it will shield any arc flash that might happen if the cables somehow get shorted together. 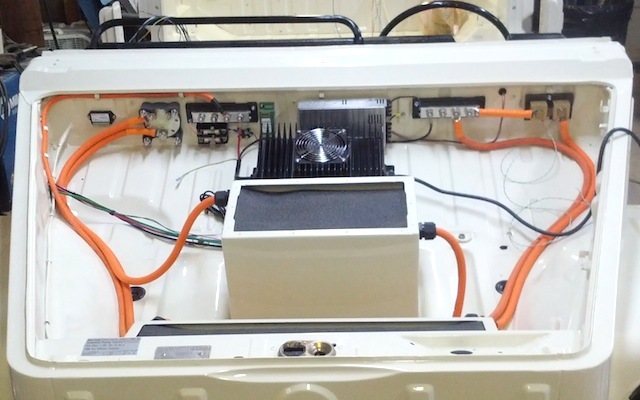 Finally, it will provide an EMI shield so that any electrical noise on the main cables from the inverter should not interfere with the car's main electrical harness that runs on the some side of the tunnel. In fact, I had to move the harness up about 2" to make room for the cables and the shield. I tried to make it look like the original shields for the heater tubes that ran in the same area. 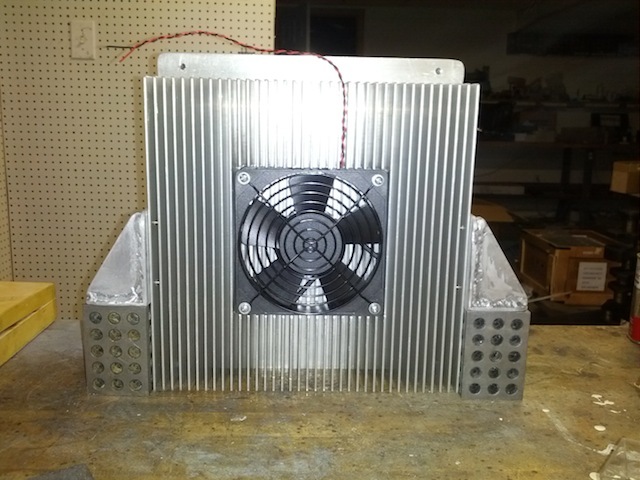 I also mounted the fan in my heat sink for the inverter. I made two mounting brackets and installed it in the engine compartment. This arrangement will keep the motor leads as short as possible. (Helps with EMI noise). I still need to strap up the cables in a few areas, but I feel good getting these routed through the car. 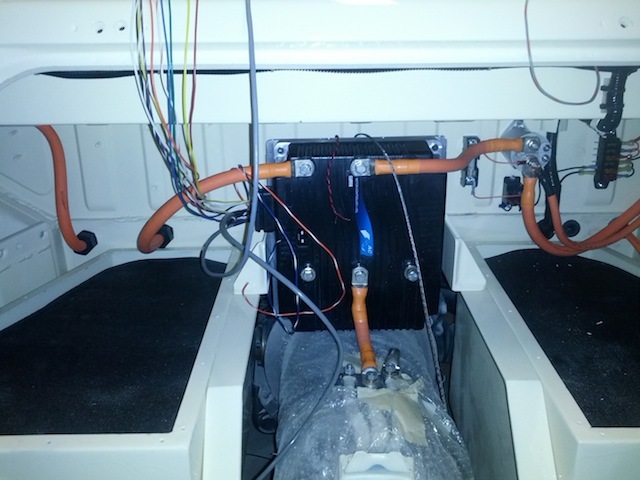 It is a big step toward completing the wiring. I did not get much done this week. Fishing season is in full swing and I spent most of the weekend fishing. However, I did manage to get a couple of things done. 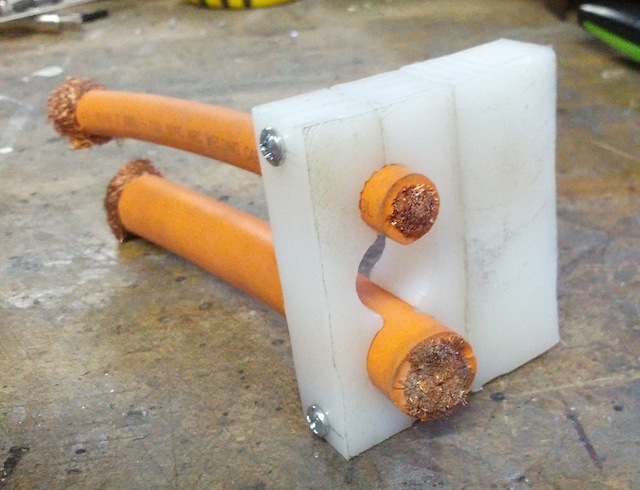 I made two cable clamps out of UHMW. I machined them on my CNC mill so that the three cables would fit tightly in them. They were made in three parts. I machine the cable pockets in two of them to form the clamp. 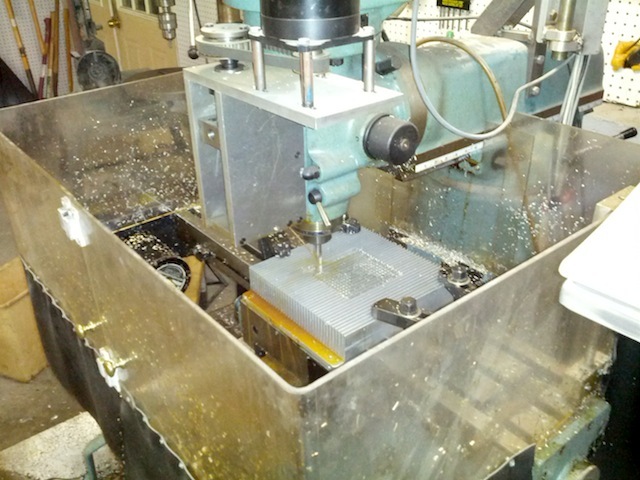 I machined a third part to act as a spacer and mounting base. Having a separate base made it a little easier to mount them. I mounted the base with a couple of #10-32 socket head screws that were countersunk in the base. The clamp half's had a clear drill for the 6-32 screw. I I tapped the base to accept the screws completing the assembly. This might seem like a minor accomplishment, but I wanted to make sure that cable would not rub on anything or interfere with the front suspension. It is also the last thing I needed to do before doing the final assembly on the front battery boxes. I also mounted J1772 Connector from David Kernzel. Like Jack said, this is really a piece of jewelry and David is an excellent machinist. I kind of wanted to show this part off so I mounted it where the old gas filler was located. I will make a polished aluminum cap that pilots on the round portion of the connector and catches the connector on the flanges. It will be a functional weather seal and look like a gas cap. It is hard to explain, but I'll show how it works in a future post. The Connector was not completely weatherproof, so I used a little Clear RTV silicone to seal it. 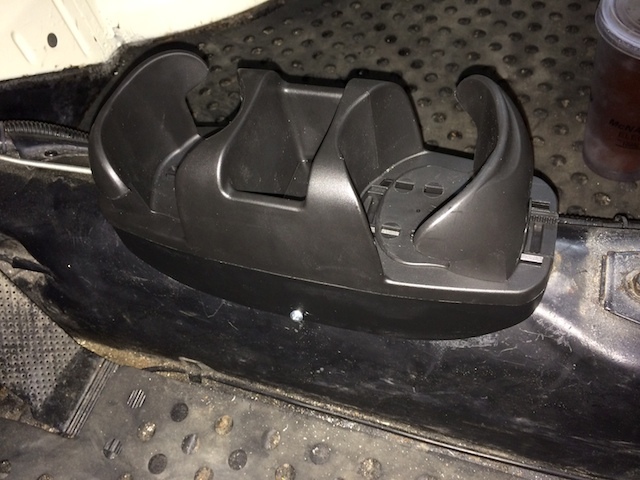 There is a slot machined in the bottom of housing. 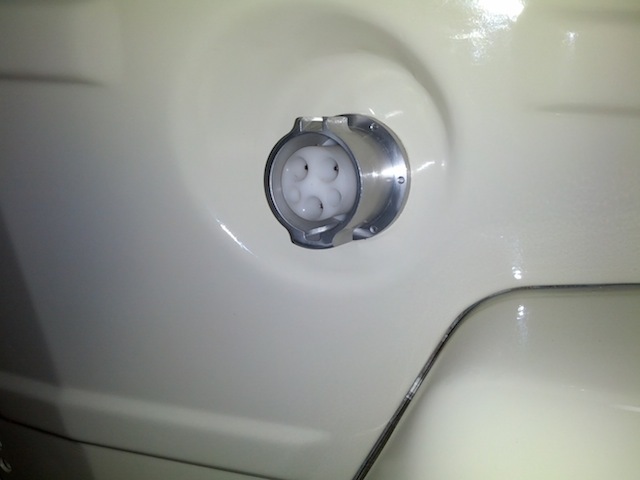 Any water that gets in would drain out of this slot and would not interfere with the plug's operation. I got a little more done over this rather rainy weekend!! 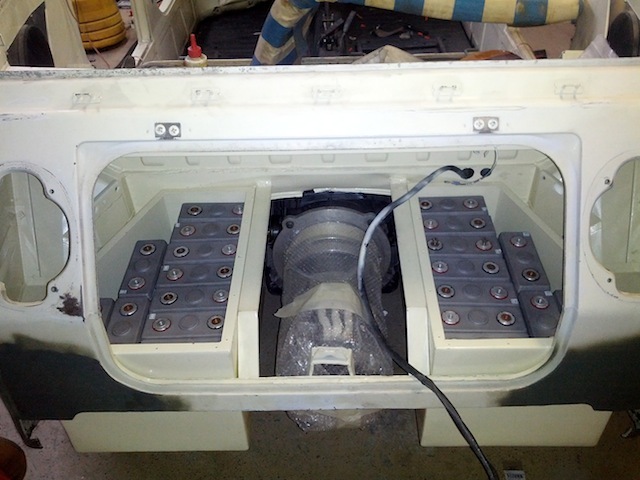 After sorting out the foam, I mounted both of the battery boxes in the front and installed the batteries. 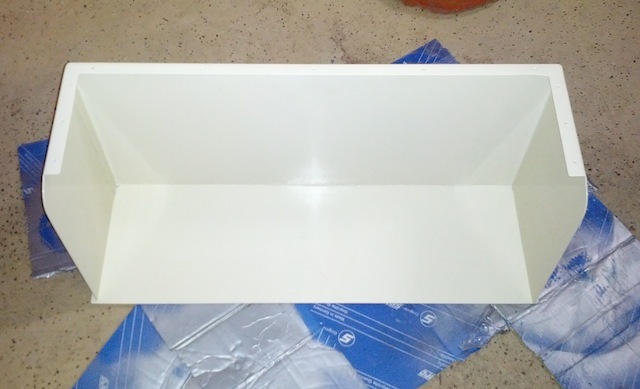 The front box is held in place with the weight of the batteries and a little RTV silicone on the bottom of the box. 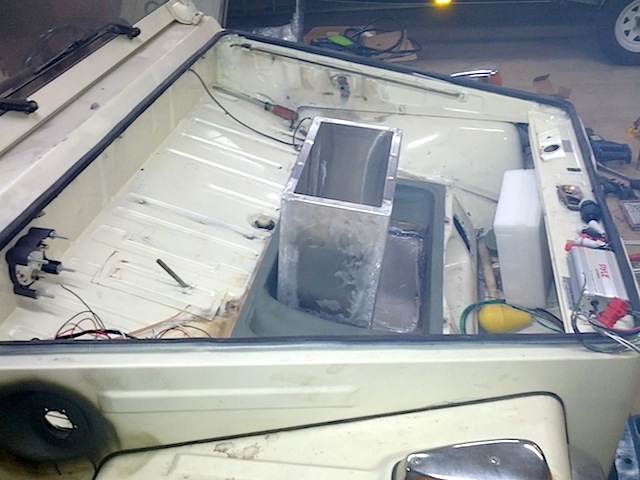 After installing the boxes I began to lay out and mount all of the components that will live under the hood of the car. 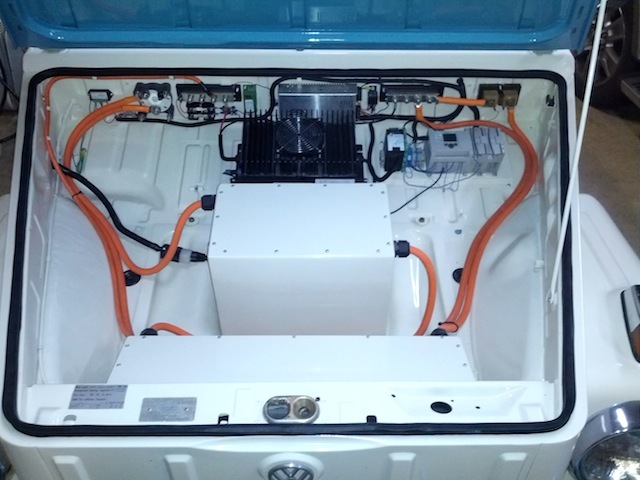 The largest component is the ELCON 2500W charger. I mounted more or less in the center to get good air flow around it. The next largest component is the Meanwell 12V DC-DC converter. It can accept 77-144VDC in and produce an isolated 12vdc output up to 40 amps. I mounted this on 3/8" stand offs from the firewall so that air can flow all the way around it. You can see two large buss bars on the firewall. The one on the left is the most positive part of the pack and the one on the right is the most negative part of the pack. This makes it easy to tap into the battery pack as needed. The green block is an isolated pack voltage transducer that will convert 0-150VDC to a 0-10VDC that my PLC can read. The input is a 15 bit signed Analog input so I should be able to read the pack voltage accurately down to about 1/100th of a volt. It also provides up to 3000VDC isolation from the pack voltage to the analog input. 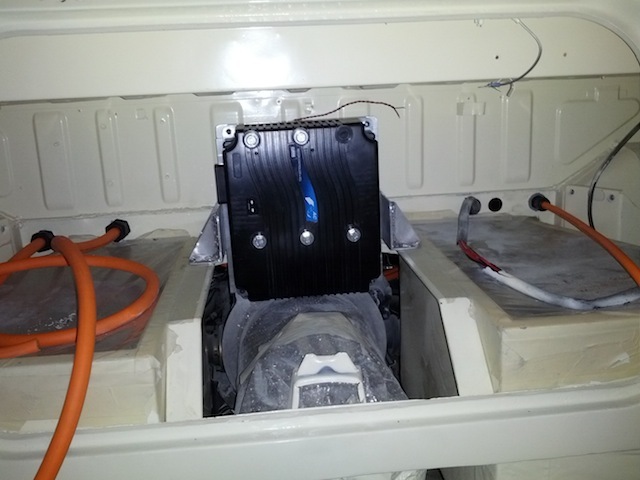 I also mounted my 800A 50mv Shunt on the far right hand side. This will connect to the thermocouple input card in the PLC. This card can read +- 50mv directly from the shunt with 15 bit signed accuracy. It should be accurate to about 0.02 amps. Because it is bidirectional, it allows the PLC to accurately keep track of the amps going into and out of the battery pack. I also added a couple of fuses for the two DC-DC converters and the blocking diode that EVTV sells. This blocking diode will only allow power to flow from the pack to the DC-DC converters. This prevents the filtering capacitors in the DC-DC supplies from trying to drive the car during accelerations as the pack voltage sags. I also mounted my J1772 controller board from David Kernzel that I bought from EVTV. This board, along with the J1772 connector will allow the car to be charged from almost any level 1 or 2 charging station. 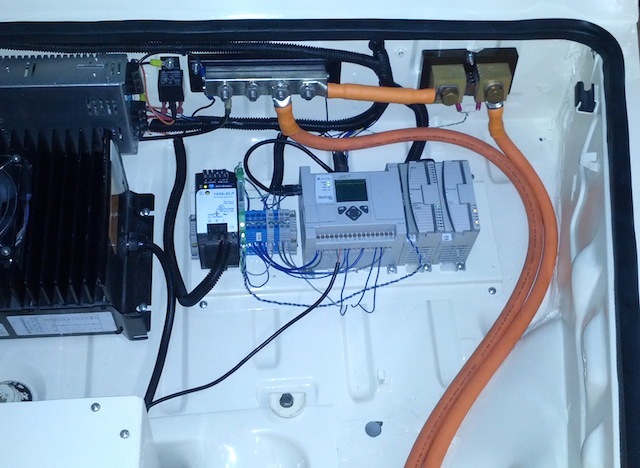 I also started to terminate the 120VDC buss in the front of the car... I am finally getting to the most fun part of the build.... Stay tuned....!! Things are moving slowly but I am getting some things done!! 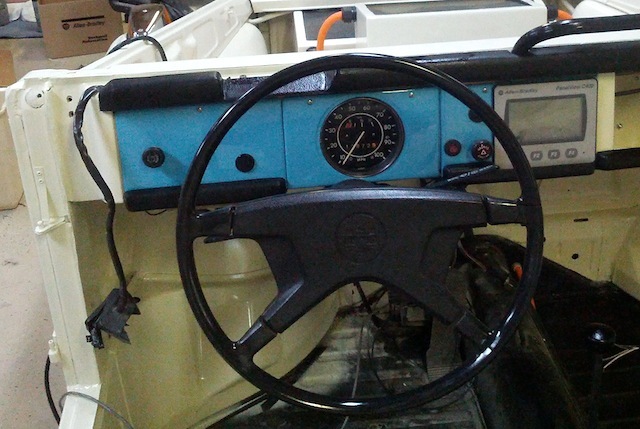 I re-assembled the dash in the car and fixed several issues with the 40 year old wiring. Everything seems to work except for the windshield wiper motor. I think it will need a set of brushes. The armature seems to be ok and the switch seems to work correctly. I spent a good deal of time getting all of the lights working. I more or less had to re-wired the rear tail lights as the previous owner had tried (unsuccessfully) to wire in to add a trailer adapter and had more of less shorted every light in the area with each other. After a few hours, I have all of them working. I also polished the plastic lenses to a good shine. They looked so good I also polished the front turn lights. I found that the hi-beams on the passenger side seem to be bured out. I ordered a new set of headlights. The Meanwell 12V DC-DC converter is up and running. It seems to function well. It easily powers the 12V Electrical system in the Thing. I also hooked up the 2500W Elcon charger and tested it. It outputs about 11.5amps at 120VAC input so it seemes to be function correctly. I have not yet bottom balanced the pack and did not want to let it completely charge the pack at this time, but it was good to see that it could put energy into the pack. I am getting very close to the first drive.... Stay tuned...!! The EVThing Lives! I did my first test drive today!!! I finally got the car assembled and wired up enough to go for my first test drive. I made a video so that you can see how it went. Obviously the car still needs more work. 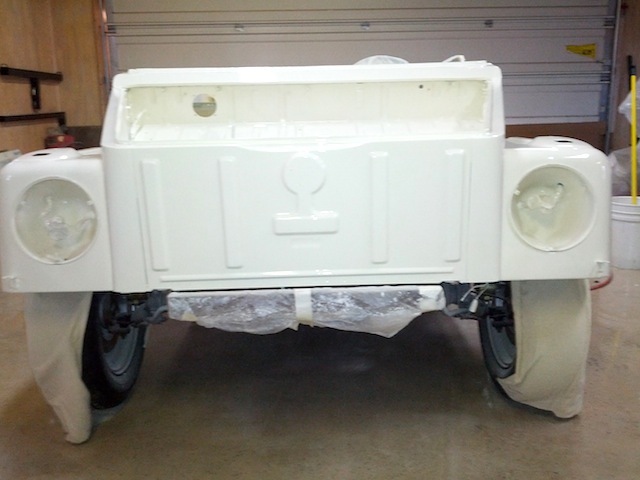 I still need to paint the doors, rear deck lid and the windshield frame. It was an absolute thrill to drive!!!! Starting to Look more like a car again! The EVThing is starting to look more like a car again. I have been driving it since May 10th without a windshield. However, I managed to get it painted up due to the warm evenings we have had. 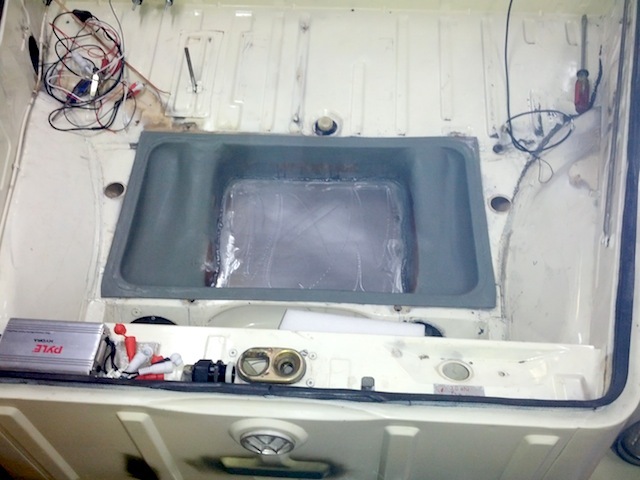 Since the hood hinge is part of the windshield frame it also allowed me to install the hood. This car is not fast, but I find it to be a delight to drive. Electric motors make all of their torque from zero RPM, so from 0-45 mph the car is quite quick. Then it starts to run out of steam. I have run it up to 65mph in third gear and it does pretty well. I think 70-75mph will be top speed in fourth gear. At least that is as fast as I want to drive it. 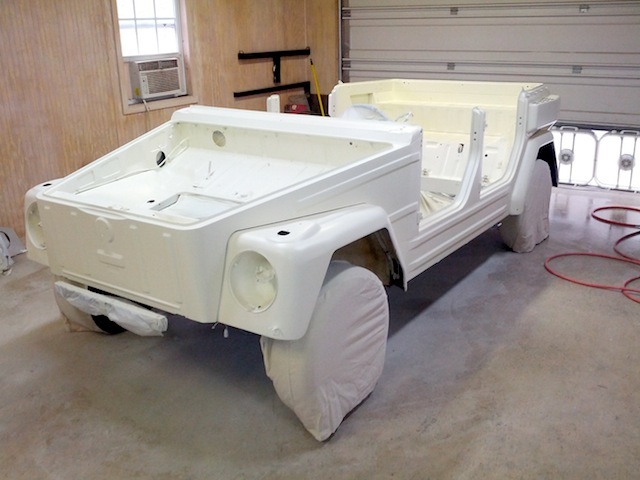 I got the doors painted and installed as well as the rear deck lid. I also installed the convertible top. It actually looked better than I thought it would. It was a beautiful 75 degree day and we decided to take a backroad drive. We drove about 35 miles and it took 60 AmpHr of the 180 AmpHr pack. That works out to about a 80-90 mile range. It looks like the car uses about 230 WattHr per mile and it is a 21KWHr pack. 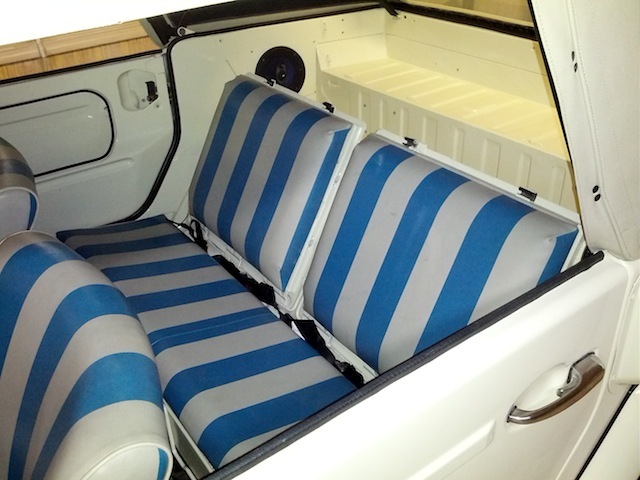 I also painted the rear seat frames and put in new rear seat covers. I also repaired and updated the lower rear seat springs. Finally, I installed a new windshield wiper motor and cleaned up and installed the wiper blade assembly. 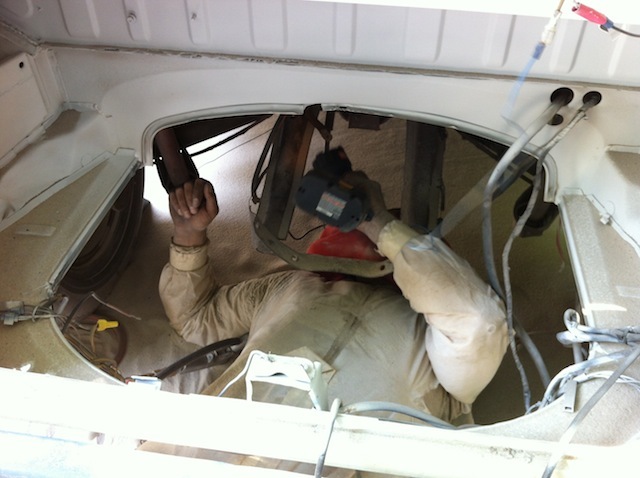 I spent the week of July the 4th working on the car and cleaning things up to get ready for EVCCON 2013 Much of the work you cannot see, like me spending a few hours applying seam sealer under the car to make it water tight where I repaired tha pans. Hopefully, it will slow down any rust to a crawl. I also painted the underside of the car with Rustoleum Flat Black paint. This stuff is great in high rust areas of your car. 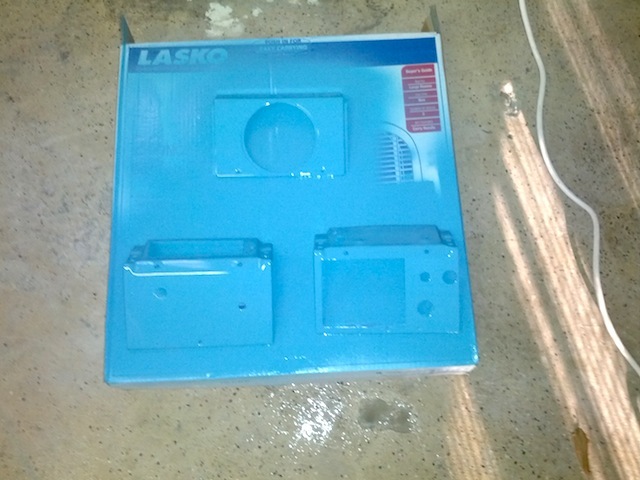 I also painted the PLC mounting bracket and fabricated and painted the lids for the front battery boxes. 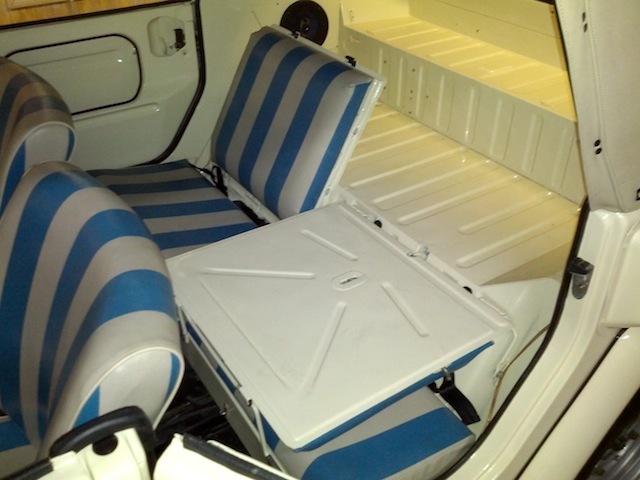 I also added a lot of little body trim pieces to the doors and newly installed rear seats. Finally I added a short little time laps video of me driving the car. Stay tuned.... I hope to add more driving video soon!!! I had a great time visiting with fellow EV builders, future builders and vendors. I can say with complete certainty that this convention is much more fun if you bring an Electric Car with you. Throughout the week there are presenttions by people with a great deal of knowledge and wisdom related to building of Electrical vehicles. It also includes a car show and a track day event where you can see how well your conversion performs. 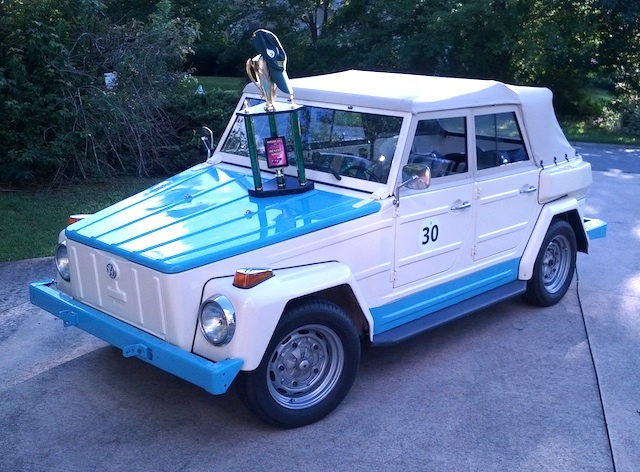 There is a 1/8 mile drag race, and an auto ross and a dyno pull available for all attendees. As for the numbers on my car, let's just say there was driver error in the autocross and I probably had the longest time of the event. I did a little better in the drag race. My fastest time was 10.98 at 61mph. Not bad for a car that made 74hp at the rear wheels on the dyno. My car also weighed in at 2399lb total weight with top and side curtains installed. 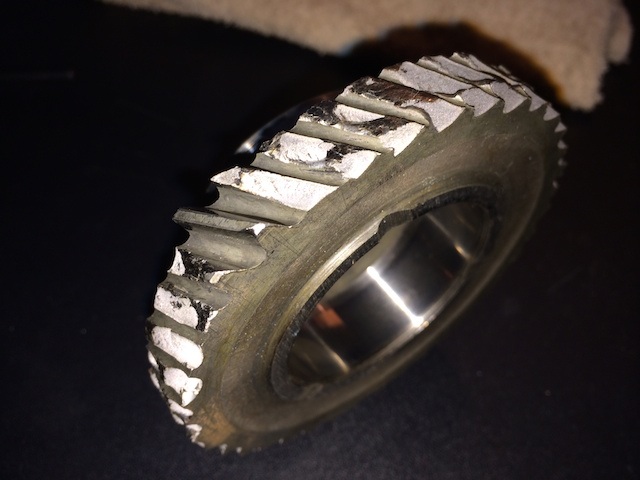 A little over a month ago, I broke 1st gear in my Transaxle, I sheared off every tooth but one. I sent the transaxle back to The Thing Shop and they had their transmission guy repair the Transaxle and install a stronger first gear for me. 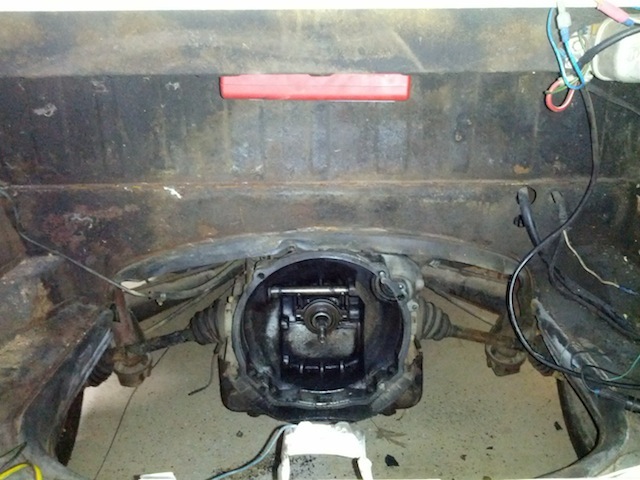 While I was waiting on the return of the transaxle, I took the time to remove the front center battery box and replace the old worn out steering box. I also found that I needed new tie rods and a new steering arm. I replaced these components and shot a little flat black Rustoleum paint in the area to do a little rust control. I also took the opportunity to make a little dash panel to house all of my audio controls. As you can see I only have a 3.5mm AUX input, a bluetooth adapter and a volume control. The little amp provided plenty of power for the four 6" speakers in the car. The speakers and AMP are from Pyle Audio. This simple audio system sounds good and really integrates well with my iPhone. This was just a little project that I had been wanted to get done for a while now. I got the Transaxle back a week ago and put in a new lightweight balanced flywheel and pressure plate. The car rides and drives much better now. Just a Little drive video of the wife and I going to lunch. 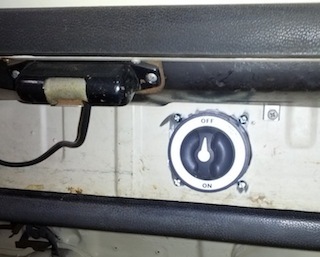 With the weather turning colder, I thought it was time for me to install a heater in the car. The most efficient heater you can install in an electric car is a Ceramic PTC heater element heater. These are commonly found in small electric space heaters that you can find at the local shopping center. While they typically run off of AC current, the element is just as happy to run off the DC current from the battery pack. PTC stands for "Positive Temperature Coefficient. What this means is that as the element heats up it resistance also goes up thus limiting the amount of current it will pull and limiting its maximum temperature. In other words is can't over heat. As a result, it is also the safest heater you can put in an EV. It took me the better part of two weeks to design, fabricate and install the heating system. I added a video showing the various steps involved and a little of my thought process on tackling the project. It actually heats the car much better than I thought it would. I pulls about 9-10 amps for the pack making it a 1000 - 12000 watt heater. I was quite pleased to find that it kept the car comfortable on a rainy 45 degree day. In a two hour drive, the heater would reduce the range by about 9-10 miles. Well, it has been a while since I posted anything. This is mainly because I have been enjoying driving the car so much I have not taken the time to do much work on it. However, I decided it was time to finish up some of the last details on the car to get it ready for EVCCON 2014 in August. 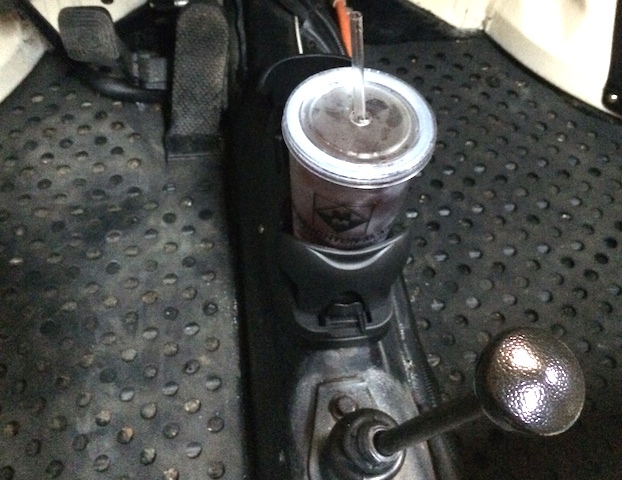 This week I tackled the all important cup holder Issue. The Thing really needed cup holders. Our family and friends have spilled quit a few drinks in the car. It is not a big deal as you can wash it out with a hose if needed. Anyway I wanted 4 cup holders that would be out of the way. The Thing is a little on the small size and finding a place for four holders was a bit of a challenge. I decided that twin inline holders in the front and rear would work best. I was going to make them out of aluminum, but I found these two at a local AutoZone parts store and they fit nearly perfectly on top of the tunnel. They are made by a company called Go Gear (UPC 27074 90001). The rear was very easy as the tunnel has a flat surface about the same width as the cup holder, so with a little waterproof 3M double sided tape and 10 minutes worth of work it was mounted and worked great!!! The front would be a little more difficult. The tunnel up front is mostly round and there was a tube (Heater Control) sticking out of the top of it with a control cable. So I made a support base out of 0.050" Aluminum and attached it with a couple of sheet metal screws. 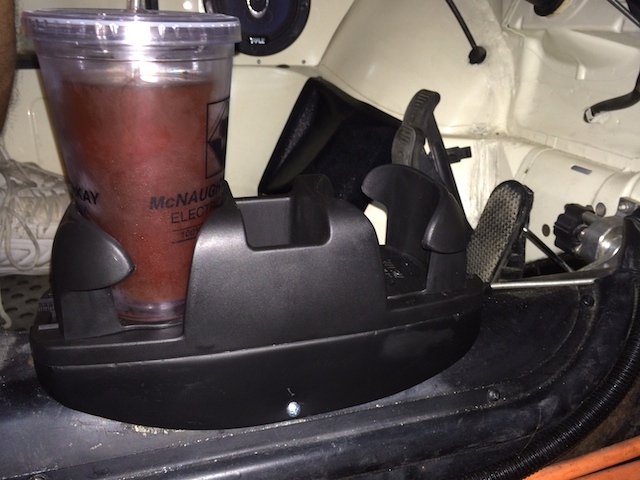 I then just bolted the cup holder on top of it. EVCCON 2014 in August. Was an absolute delight this year. This year felt like I was hanging out in a local shop with 150 old friends that enjoy the same hobby. Words cannot convey how much fun I had. 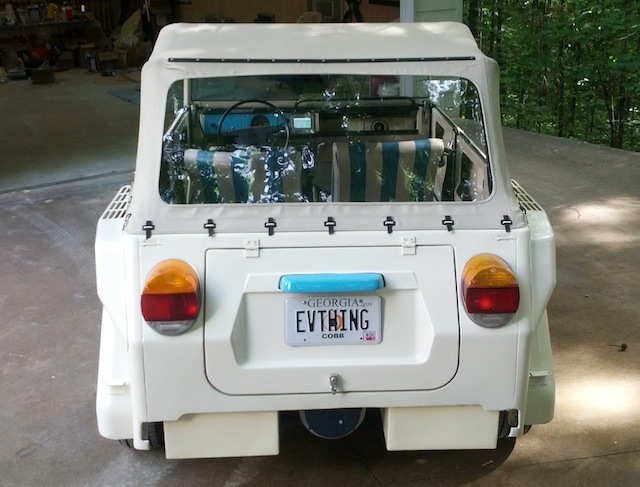 I met at least two people in Atlanta who are about to start builds of their own and one who not only built a solar powered truck, but actually drove it from Atlanta to the Cape (about 500 miles) This is a true die hard custom EV enthusiast. If you are interested in EV conversion of cars, you simply have to attend this event. It is like no other in the world. 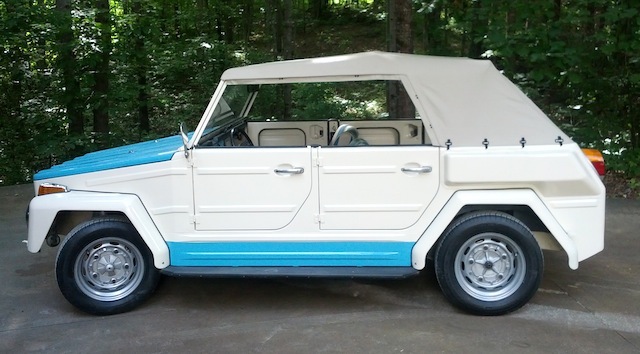 You get to actually talk to the guy (or gal) who actually did the conversion and most likely go for a ride in it or even drive it. The number of people from other countries who attend this even is astonishing. 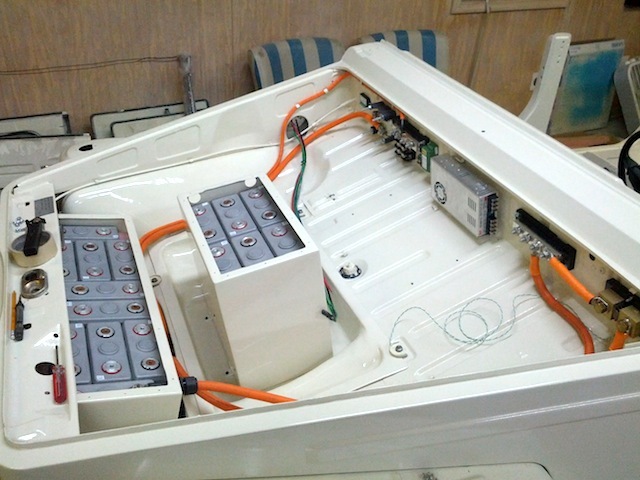 My next EV project is to convert an Aristocraft boat to electric drive. I must thank Jack Rickard of EVTV for this wonderful opportunity. I cannot believe the he has entrusted me this conversion with such a nice boat. I will do my best to make him proud!.